About nine months ago, we defected from our CSA subscription. Community supported agriculture is a really awesome way of buying produce if you don’t mind eating kohlrabi all the time. We unfortunately do mind at great deal. Our CSA totally sucked the life out of us. Too many turnip greens and too much guilt. Have you ever noticed that when food people first subscribe to a CSA it’s like “OMG, best thing ever!” You start with all kinds of horn o’ plenty photos of the CSA bounty. Then you get real busy with Chez Panisse Vegetables, Plenty, and Tender: A Cook and his Vegetable Patch. “I’m Yotam motherfucking Ottolenghi!” you roar, and you dress those vegetables with yogurt and sumac. “I’m a bacon-studded vegetarian!” you shout, to no one in particular. You’re gonna use all those beet and turnip greens if it kills you, goddamn it! You subsist on beet and turnip green frittatas and quiches for a few weeks. You roast those beets. You shred them raw, and dress them with mustard. You eat so many beets it hurts. Like, actually hurts. You realize, somewhere about two months in, that you have some kind of digestive aversion to beets. You have literally given yourself irritable bowel syndrome from all the beet-eating, but you keep going. You slog through those long winter months. You like borscht, really! Lots and lots of borscht. You go on a trip at some point, and even though you try to prepare by “gifting” your friends your turnips (“MERRY CHRISTMAS MAN!”), a fridge full of vegetables somehow rots in your absence. Somewhere along the way, you start stockpiling kohlrabi, because you don’t know what to do with it. Inexplicably, it neither rots nor improves with age. Even when you figure out what to do with it, you discover that nobody actually likes kohlrabi. Except Kashmiris, apparently. Working your way through a battery of Kashmiri kohlrabi recipes, you begin to suspect that Kashmiris don’t really like kohlrabi either. Sometime in the spring, you become delirious over a tiny basket of strawberries. “Our strawberries came in!” you announce to your friends, who don’t understand why you had to wait until your CSA deigned for you to eat strawberries. Because you are drowning in guilt, and turnip greens, and ganth gobi, friendo. After a long talk with your spouse and your therapist, you decide to quit your CSA. You send a long, apologetic email to the farm. “It’s no you, it’s us!” you write, even though there was a half-rotten plum in the last basket, and the greens were full of mites. Your ears burn with shame. If anyone asks about your CSA, as just a year earlier you talking of nothing else, you sheepishly say that it was too many vegetables for just the two of you. “If we had kids, maybe…” you say, because people with kids obviously have all the time and energy in the world to figure out how to get their kids to eat a never-ending stream of kohlrabi and turnip greens. Then you go back to the farmer’s market and bam! 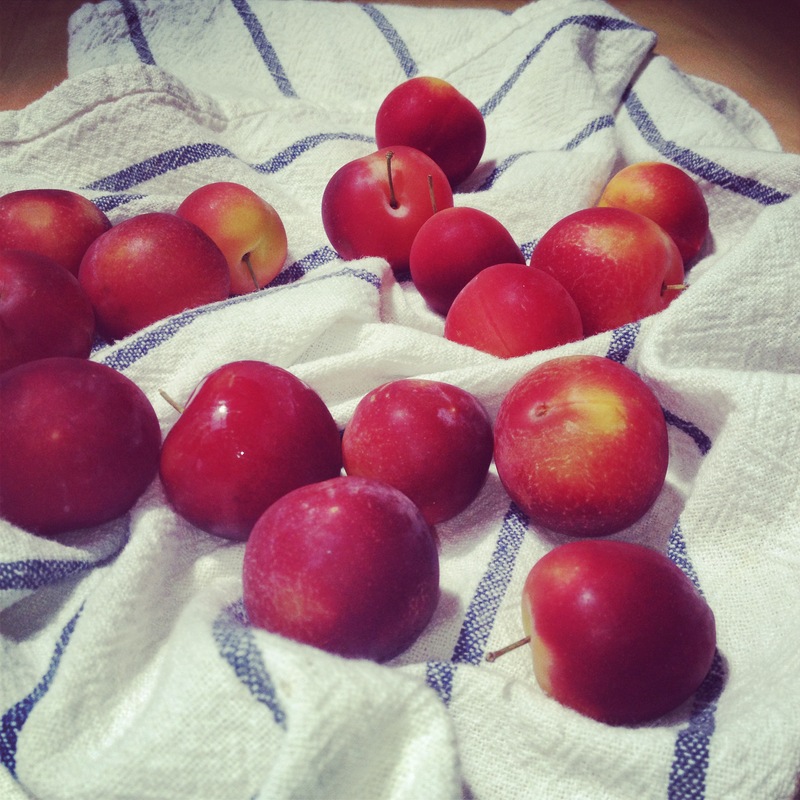 There are fifteen new varieties of pluot since your last visit. And you don’t ever have to buy kohlrabi again, ever. I bet you have a really amazing CSA that isn’t at all about turnip greens and guilt. I’m so happy for you. The farmer’s market of our fair hamlet is rather underwhelming by Southern California standards—and by that I mean, it would still murder a green market most anywhere else. So we’ve returned to shopping at the Irvine Farmer’s Market at University Center on Saturday mornings, which remains, for my money, the best farmer’s market in Orange County for fruit and vegetables. My favorite fruit stand there is Arnett Farms of Fresno, where they have taken the hybrid thing to the extreme. I have a limited attention span for fruit, and I want the Forever 21 of farm stands. At last visit, Arnett had nine different varieties of pluot in every color imaginable, and we’re only at the beginning of stone fruit season. I realize I’m totally Columbusing here, but bear with me. My most exciting discovery this week is the cherrium, a cherry-plum hybrid. About an inch in diameter with a tiny stone, they are like everything I’ve ever wanted in a fruit: tart, sweet, firm, and mouth-poppable. I’ve devoured a giant bag in thirty-six hours, and I’m nervous they will be gone by next week. You should get some before they are gone, unless of course you are beholden to your CSA for your stone fruit selections. Now if your CSA has cherriums, I think you’ve hit the jackpot. Is “friendo” from No Country for Old Men?